Available in brands like Lg, Samsung, Whirlpool, etc. used for houses and restarents, hotels, canteens, etc. Hydrotherapeutic Massage stimulates blood circulation, relieves fatigue and tones muscles. 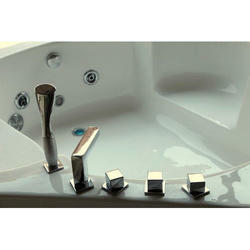 Scientists have demonstrated the effectiveness of the stimulating, revitalizing action of whirlpool therapy. The fact more and more health clubs & beauty centers are using whirlpool massage in their physiotherapy is proof of the indisputable benefits of the whirlpool technique. Clear, transparent and sterile wort is desired for fermentation to make an excellent quality beer. Whirlpool is the tank deviced internally to remove unwanted trub. The design and performance of the whirlpool depends on an understanding of the relationship between particle size, wort gravity, centrifugal separation and sedimentation.